Dutch Bros celebrates 10 years of fighting ALS by donating over $758,500 to MDA to support research and family services. Dutch Bros' Drink One for Dane day raised $758,500 for MDA as the fight continues to end ALS. Friday, May 6, marked Dutch Bros’ annual Drink One for Dane day. On this day, Dutch Bros celebrated 10 years of fighting Amyotrophic Lateral Sclerosis, ALS and, with the help of the community, raised a record breaking $758,500 for the Muscular Dystrophy Association, MDA. All 263 Dutch Bros locations in seven states donate proceeds from their day’s sales to MDA in support of ALS research and family services. This record breaking year surpassed last year’s donation by nearly 50 percent – bringing the company’s total donation over the past 10 years to over $2.53 million. Funds will benefit MDA in hopes of finding a cause and a cure for ALS. "The impact that is made by our community is beyond what I could have ever imagined," said Travis Boersma, Dutch Bros co-founder. "My mind is blown every year by the generosity of our customers, franchisees and broistas. Thank you." Drink One for Dane day will always be a way the Dutch Bros family can honor its late co-founder, Dane Boersma, who passed away from this disease in 2009. Dutch Bros, as a company, is still influenced by Dane’s inspiration, love and passion for music, a compelling future for all and good vibes. ALS is a disease that impacts so many lives within Dutch Bros and its communities. It is an incurable disease that affects the parts in the nervous system that control muscle movement. Most people who are diagnosed with this fatal disease usually lose their battle within three to five years. Together, we are making a difference to end ALS. Dutch Bros will continue to rally for those affected with this disease until a cause and a cure is discovered. Dutch Bros Coffee is the country’s largest privately held, drive-thru coffee company, with over 260 locations and over 5,000 employees in seven states. Dutch Bros serves specialty coffee, smoothies, freezes, teas and a private-label, Dutch Bros Blue Rebel™ energy drink. The rich, proprietary coffee blend is handcrafted from start to finish. Every ingredient is measured, every process timed, and every cup perfected. 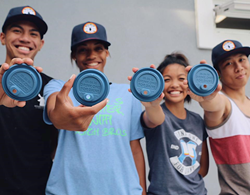 With a mission of, “Making a Difference, One Cup at a Time,” Dutch Bros donates over $2 million annually to nonprofit organizations and local causes selected by local owner-operators. Dutch Bros. Coffee is headquartered in Grants Pass, Ore., where it was founded in 1992 by Dane and Travis Boersma, brothers of Dutch descent. To learn more about Dutch Bros, visit http://www.dutchbros.com, like Dutch Bros Coffee on Facebook or follow @DutchBros on Twitter.